Interactive cocktail making class featuring whiskey and bourbon. 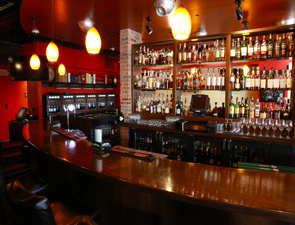 Guests will learn to make a Stone Sour with Bulleit Bourbon and an Irish Godfather with Redbreast Irish whiskey. $30 per person. Reservations are required by calling 702.735.9463. Space is extremely limited. Following the first two popular classes in the interactive cocktail making series, Double Helix Wine & Whiskey Lounge at Town Square presents the March class featuring bourbon and whiskey. Guests will perfect the techniques to make a classic Stone Sour with Bulleit bourbon and the Irish Godfather made with Redbreast Irish whiskey while enjoying Double Helix’s signature arancini. Recipe cards will be handed out so guests can replicate the cocktails at home. With the introduction of the first Chef’s Table within a buffet, Bellagio once again raises the bar in buffet dining. This unique V.I.P. table experience includes a skilled chef team that pampers guests from beginning to end, preparing the finest culinary dishes tableside. 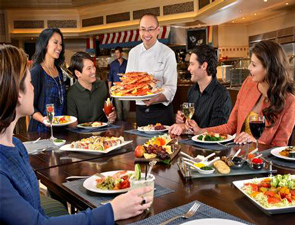 Upon arrival to Bellagio Buffet, guests will bypass the main line and go to the front entrance of the restaurant where they are greeted and escorted to the Chef’s Table. Bellagio Buffet chefs welcome the group as they are seated and describe the assorted seasonal fruits, varieties of fresh house-baked breads and selections of canapés displayed on the luxurious table. Following, the chefs review a specialty menu, created with care using the finest seasonal products available. The menu may be adjusted based on guests’ preferences and dietary restrictions and includes a variety of exquisite culinary selections such as artisanal cheeses, charcuterie and caviar; live-action salad creations with fresh dressings, vegetables and sides; premium meat carvings such as lamb and prime rib; and a house-made chocolate fondue presentation for dipping fresh fruit, brownies and marshmallows. Throughout the Chef’s Table epicurean adventure, guests are encouraged to explore The Buffet’s American and International cuisine stations at their leisure, providing the optimum way to enjoy all aspects of a Las Vegas Buffet experience. The Chef’s Table is available seven nights a week during dinner and gourmet dinner service, priced at $53.99 and $59.99*, respectively. Reservations are accepted for parties of eight or more and can be made through email at buffetchefstable@bellagioresort.com. For additional information and high-resolution images, click here. Adding yet another note of sophistication to the indisputably luxurious offerings at Bellagio Buffet, the Chef’s Table exemplifies the highest levels of service for which the AAA Five Diamond resort is known. Restaurant Guy Savoy received the largest black truffle in Caesars Palace history this weekend, weighing at an impressive 1.17lbs (531.8 grams). 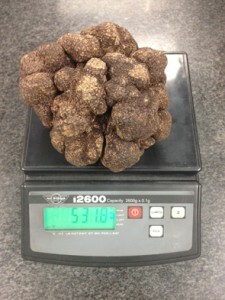 The black truffle measured at approximately 6 inches in length and was retrieved by a trained Lagotto Romagnolo from the Périgord region of Southern France. The previous record for the largest black truffle at Restaurant Guy Savoy weighed just short of one pound, making this particular truffle part of Caesars Palace history. The high value of the French delicacy produced more than eight Black Truffle Prestige menus this weekend. The menu selection features the freshest seasonal ingredients combined to create signature dishes such as the famed Artichoke and Black Truffle Soup. The Black Truffle menu will be available until mid-March 2014. The Knickerbocker Hotel, a legendary New York landmark in Times Square set to open its doors in Summer, 2014, has partnered with one of the nation’s most recognized master chefs, Charlie Palmer. Enviably situated on the southeast corner of 42nd Street, overlooking Times Square between Broadway and Bryant Park, The Knickerbocker Hotel will feature several exceptional dining venues, including a full service restaurant and bar, a ground-level café, a 2,200-square-foot event space and a 7,500-square-foot rooftop bar and terrace offering an unrivaled panorama of New York City’s vibrant skyline. “The Knickerbocker Hotel is a ‘classic reinvented,’ infusing the history and legacy of a New York landmark with a modern approach to service, design and cuisine. To ensure a sophisticated level of taste throughout the hotel, we’re honored to collaborate with Master Chef Charlie Palmer on the entirety of our food and beverage program,” said Jeff David, Managing Director of The Knickerbocker Hotel. With over three decades of experience, Palmer is renowned for his signature style of progressive American cooking featuring regional ingredients in unexpected and deeply flavorful ways. 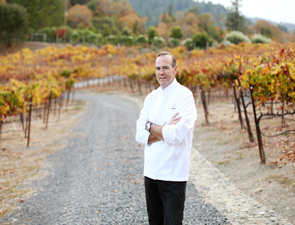 As one of the first adapters to the farm over factory food philosophy, Palmer’s forward thinking approach has earned the success of his hospitality group empire, which currently includes restaurants, boutique hotels, and food-forward wine shops throughout the US. Located just steps away from The Knickerbocker Hotel is Palmer’s flagship restaurant, the Michelin-starred Aureole, one of the most coveted dining establishments in New York City. Hotel guests will enjoy priority access and preferential treatment at Aureole, which just celebrated 25 illustrious years. 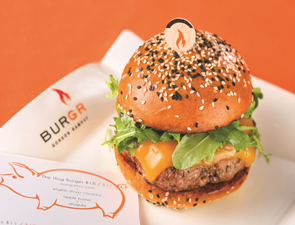 KGB: Kerry’s Gourmet Burgers at Harrah’s Las Vegas is offering a year-long burger and shake series, beginning this month. Each flavorful burger and shake creation, crafted by master chef Kerry Simon, is only available for one month. The burgers are served with fries and priced at $14; shakes are $6, and the burger and shake of the month combo is $18. The series kicks-off with the American Kobe Burger, available only for the month of February. The burger is made with 8 ounces of American Kobe beef, apple-wood smoked bacon, a fried egg, Asian coleslaw and sweet chili cilantro aioli, served on a white bun. Accompanying the burger is the Mocha Coconut Milkshake, made with mocha coconut ice cream and topped with whipped cream and toasted coconut. Dubbed the “Rock-n-Roll Chef” by Rolling Stone magazine, Kerry Simon knows a thing or two about burgers. In an upbeat atmosphere, Simon offers patrons the ultimate burger selection with his special flair. 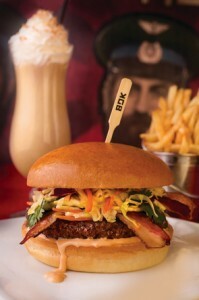 He serves up a menu of uniquely inventive burgers, signature snacks and sides including his “Iron Chef”-winning sliders, tater tots and sweet selections such as cotton candy and the signature Captain Crunch milkshake. 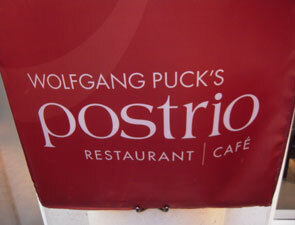 The restaurant is open Sunday to Thursday from 11 a.m. to 11 p.m. and Friday and Saturday from 11 a.m. to midnight. For reservations or more information please call 702.369.5065 or visitwww.harrahslasvegas.com. Last Saturday night, the iconic Las Vegas hot spot, XS nightclub, unveiled a new specialty cocktail, the Five Star, priced at $5,000, in celebration of the venue’s five year anniversary party. The drink will only be available in 2014 in honor of the landmark year. The Five Star is named for the level of service found at Wynn Resorts, which collectively holds more Forbes Travel Guide Five-star awards than any other independent hotel company in the world. Managing Partner Jesse Waits continuously credits the nightclub’s success to the dedication and level of service that can only be found inside of Wynn Las Vegas. The cocktail is a blend of exceptional liquors including Louis XIII Rare Cask 42.6, Pappy Van Winkle’s Family Reserve 23-year, Martini Gran Lusso 150th Anniversary Vermouth, D.O.M. Benedictine “Black Monk” 500th Anniversary Edition, along with Peychaud’s Bitters, Angostura Bitters and garnished with flamed orange oils. 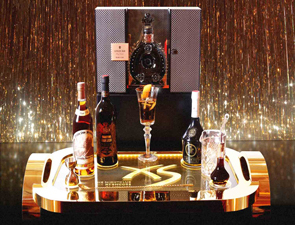 The drink is made tableside by one of the expert bartenders and delivered on a specialized gold tray to carry the award-winning nightclub’s design throughout the experience. This addition to the menu joins The Ono, the specialty cocktail which has been in place since the opening, highlighted by Charles Heidsieck Champagne Charlie 1981 and Louis XIII de Remy Martin Black Pearl cognac, The Ono includes men’s sterling silver XS cufflinks and a woman’s 18K white-gold chain with a black pearl pendant, for $10,000. ARIA Resort & Casino will invite guests to get their flapjack fix with signature Red Velvet Pancakes during National Pancake Week, Feb. 9-15. 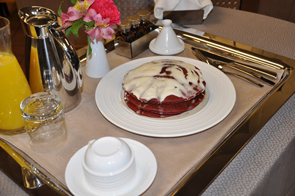 ARIA Executive Chef Anthony Amoroso will construct the flavorful Red Velvet Pancakes via video on ARIA’s Facebook page Tuesday, Feb. 11 at 10 a.m. PST. Viewers will receive step-by-step instruction on how to create the delicious culinary offering at home. At 10:30 a.m. PST, Chef Amoroso will be available for any questions via ARIA’s Twitter account using #RedVelvet. Available at ARIA Café and ARIA’s In-Room Dining menu, the deliciously sweet dish offers a gourmet twist on an indulgent resort favorite. The soft and pillowy dough is created using favorable amounts of flour, cocoa and baking powder, granulated and powdered sugar, buttermilk, eggs and red food coloring. Once the pancakes are created, a sweet cream cheese icing made of sugar, vanilla extract, cream cheese and softened butter is melted and poured over the colorful stack. ARIA Café is open 24 hours a day and is located on the casino level next to the guest elevators. For reservations, call ARIA Restaurant Reservations at 702-590-8544. 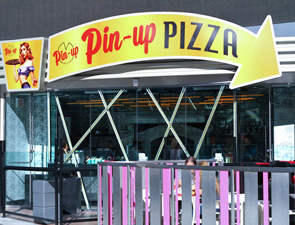 Serving up the largest slice on the Strip, Pin-Up Pizza, now open at Planet Hollywood Resort & Casino, is celebrating Pizza Day with drinks, pinup models and of course, lots of pizza. Guests who purchase one of Pin-Up’s 15 inch long slices of pizza will receive one free beer. The New York style pizza eatery is located along Las Vegas Blvd. next to Pink’s Hot Dogs with an entrance from the street as well as inside of the casino, and is perfect for grab-and-go, or with its outdoor patio, to take in the striking view. Using the freshest and highest quality ingredients, Pin-Up’s menu features classic favorites such as cheese and pepperoni, as well as white, artichoke, margherita, sausage and meatball pizzas. Each hand-tossed pizza pie measures 30 inches across and uses 4lbs of dough, leaving each slice to measure 15 inches long by 6 inches wide. With its Neo-Neapolitan style and cooked in a gas oven, the pizzas are evenly cooked with a crust that maintains a crisp with each bite. Pizza isn’t the only option at Pin-Up, also featured on the menu are hand rolled garlic knots, stromboli rolls and pinwheels, tomato mozzarella salad and piped-to-order cannolis. Accessible from the Strip, Pin-Up’s modern ambience features indoor counter space, with a full view of the giant gas oven and kitchen, as well an outdoor glass enclosed patio dining and drinking area. Continuing the brand’s theme, Pin-Up features Pin-Up Pizza girls, adorned in retro rockabilly uniforms bringing to life Bettie Page, Jayne Mansfield and other famous pinup ladies of the ’50s. Pizza Day at Pin-Up Pizza will be celebrated on Sunday, Feb. 9 from 11 a.m. to 2 a.m. Guests will receive one free beer with the purchase of a slice of pizza, limit one per customer. Pin-Up Pizza is open 11 a.m. to 2 a.m. Sunday through Thursday, 11 a.m. to 4 a.m. Friday and Saturday. For more information, please visitwww.planethollywoodresort.com or by calling (702)785-5888.